Team Fortress 2's End of the Line update—while paired with a really fun film—was anemic, to say the least. After so much hype ended in such a trainwreck, many feared Valve might've been signaling its intention to put Team Fortress 2 out to pasture, or at least ease off on making new stuff for it. The new Smissmas update, however, begs to differ. This one's a biggy, with an entire new mode as the star atop its tree. The mode is called Mannpower, and its biggest features are nine power-up items any class can use. Also, grappling hooks. Grappling hooks for everybody! Just like what I hear in my head when I watch that one episode of Oprah. Looks like somebody at Valve watched a few of those Overwatch trailers. 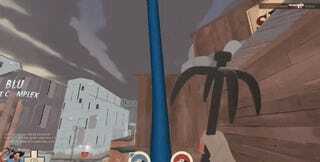 "It's an in-beta CTF-like game mode with grappling hooks and nine different types of powerups. Mannpower alters a few game rules. For one, random critical hits have been disabled. Additionally, teams won't be able to capture the enemy flag unless your flag is at your base. (When your flag is away from your base, you can touch it to instantly return it to base.)" "Mannpowers exist in the world and can be picked up by all classes. When picked up they add abilities and enhancements to the player carrying it. Mannpowers can be dropped at any time by hitting your dropitem key, and will drop automatically when the player carrying it is killed. Note that you can only carry one at a time, and that you can't take powerups into respawn rooms." Mannpower mode is still in beta, but Valve wants the community to be involved early with this one. Beyond that, Smissmas includes new "festive" weapons, 29 new cosmetic items, stocking stuffers, changes to Mann vs Machine mode, and a slew of balance tweaks mostly focused on the Demoman. It's not a multi-day event like other TF2 updates, but it's still decently substantial. Part of me wonders if Valve put it out so quickly to silence the cries of "Team Fortress 2 is dead," but new stuff is new stuff. Have you had a chance to give it a go? What do you think?